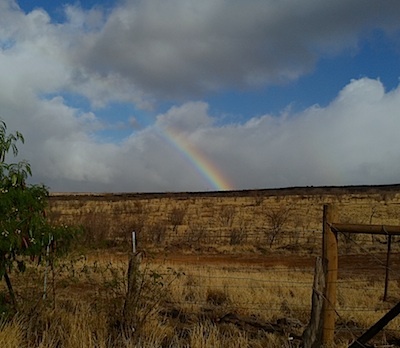 An amazing rainbow behind Matt Yamashita's house on Molokai. To read the first part of this post, please click HERE. Our flight to Molokai was now ready for boarding. We lined up and, again, made our way across the tarmac and up the stairs to the little plane. We crammed ourselves in–filling the plane to capacity. There were other musicians on board. I recognized an ʻukulele case being put into an overhead compartment. If we were delayed again, I was going to suggest breaking our instruments and have an old-fashioned kanikapila (jam session)! The plane taxied down the runway and soon we were airborne, heading to Molokai! The flight was no “bumpier” than usual. Although we DID experience a long period of flying through dark clouds. (Yikes!) Usually, I love sitting near a window on this flight so that I can watch the ocean below us. I love the way the light dances on the water. But this time, the window seat meant viewing our “obstacles” the whole way. Auē! Suddenly, the plane broke through the clouds and I could see the red dirt below us. The pilots managed to make a flawless landing, despite the wet conditions. We deplaned onto a wet tarmac with cool mist all around. The airport on Molokai is in Hoʻolehua. I had never landed there in the rain before. It’s always been dry, so this was a welcome treat. Pops was there, waiting with a smile and beautiful ti leaf lei that he’d made for me earlier that day. We made our way back to the house in Kaunakakai. Once owned by Mom and Pops, it’s now the home of Kolokea and her family. We hung out and ate and laughed a lot. But I could barely keep my eyes open–I had been awake for almost 2o hours. And the moments of stress throughout the day had taken their toll on me, for sure. The roosters in Kaunakakai don’t seem to understand the rule of crowing only when it’s time to get up. THEY CROW ALL NIGHT LONG! Maybe they’re confused? I know it made ME confused! Every time I heard one of ‘em, I thought it was dawn–and time to get up. Auē! After a few hours of sleep, Pops and I headed out of Kaunakakai in the truck and made our way toward Hālawa. Matt’s home is located high up on a hill–with the ocean in front and beautiful open land in back. I love it when we visit him at his home. Of course, he’s a wonderfully hospitable host. But it’s also a chance to see some amazing natural views. As the truck pulled up to the house, I looked out the window and saw an INCREDIBLE sight: a stunning rainbow. Sure, a rainbow made a lot of sense from a scientific point of view. It had been raining for days. Sunlight managed to find its way through the clouds–that makes for a beautiful rainbow. But I took that as a sign, a hōʻailona, that this trip was going to be blessed. Right on. This entry was posted on Tuesday, November 23rd, 2010 at 5:58 PM and is filed under AHC Home. You can follow any responses to this entry through the RSS 2.0 feed. Both comments and pings are currently closed.